We treat every customer individually and being absolutely honest - we are not the company that's only selling goods we are building the partnership. Our aim is to help the Client - not to sell the most expensive solutions which may be not suitable. Our approach has been appreciated and that's why our sales are growing so fast. Our internal logistics products are always perfectly matched to the one's production plant needs and their functionalities and reliability are starting to be famous all over the World. 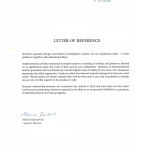 Reference letter from Hutchinson company for realisation of project of dedicated intralogistics systems delivery. 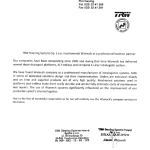 References from TRW company - design, production and delivery of Wamech's standardised internal logistics products - E-Liner platforms and KLT trolleys. 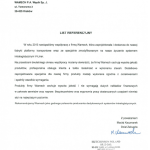 Reference letter from Valeo company - design and delivery of many different dedicated internal logistics products. 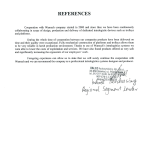 The cooperation between our companies has started in 2000 and is being continued untill today. For Valeo we are delivering our standard intralogistic products as well as we are designing customised solutions. References letter issued by GKN company - delivery and implementation of V-Liner and dedicated trolleys for transport of components. Our intralogistic products have been delivered to several localizations all over the World.